Facebook wall script with expanding URLs one of the popular post on 9lessons. It is just collaboration of my previous jquery articles. Recent days I received lots of requests from my readers that asked to me how to display old updates. So that I have decided to release new version with user control support. This script very easy to install few lines of code changes, take a quick look at following steps. The download script contains three folders called includes,css and js with PHP files. Sample database design for Facebook wall script. Contains there tables users, messages and comments. 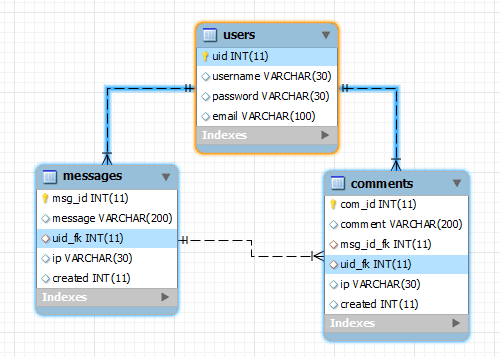 You have to create following tables otherwise find out wall.sql and execute SQL queries. Contains user management details username, password, email and etc. Contains messages/updates details messages, created, user and etc. You have to modify Host, Username and Password. Contains PHP and HTML code. Included db.php, functions.php, sessions.php and load_messages.php. How to add new function/method. This is amazing! Wow really liked it. "error. Please can you update the toLink function with the preg_replace.? Thanks a lot mate for your really nice and ellegant work.. Keep up! download is not working it is going to the tutorial. also why is there no facebook connect for the comments on this site? Subscriber emails update every 18 hours. Why no facebook connect for comments? Good Tutor Srinivas. Its amazing. I like it. Great but what about add pictures with a lightbox ???? Excelente hermano, mil y mil gracias. Hello, this post it's really great. How can I do to refresh the wall, I mean to make a new comment show automatically while the user has opened its wall? Take care. I would like to implement Parent Child relationship between html tables using Datatables plugin and php. Could u show me one example how to implement with php and jquery plugin. How to select an image(blob) from the oracle database and how to insert an image into oracle database using php and jquery. Could u please give me a example. great tutorial, can you make a version with voting system? Note for anybody who may be struggling with this like i was..This is written in PHP5. You must be using PHP5 for this to work. i have uploaded script to my site and changed the db files as explained. The box to insert a message is displayed and messages are stored in my database but not on the page. php_network_getaddresses: getaddrinfo failed: No such host is known. Is it possible to combine your Collapsed Comments funtion to this. May be problem with $ip=$_SERVER['REMOTE_ADDR']; meanwhile just disable this line. is there problem in server ? Wow.Its really wonderful script on php.This blog really helps visitors understand face wall script.I must appreciate your efforts. Srinivas, is it necessary to login as a user to post? If so, how to implement that? Hi! I visit your blog very often, but I didn't comment your posts until now. The scripts posted here are really great. I'm working with ASP.NET not PHP, and every script I found here is just a good guide to me to do that working in ASP.NET with jQuery of course. Great work, keep going on. Hello, how can I implement a automatic refresh like facebook? can you please do a tutorial? it would be really great. please. you do great tutorials, keep going on. Still having problems with messages and comments not being displayed when the pages is refreshed. Anybody else know a fix to this? Why when i put a link of youtube video is cok and in my downloaded code only shows the link? I like this article. it is really nice. @Shuya Please try to learn at least basics. Hi, I have a little trouble with this script. At the time I click on the "update" button it doesn't update the messages, I mean, the message I wrote appears in the database but not on the wall, how can I fix it? Can you provide a little more detail and how to set this up? I have created the tables, changed the database settings and uploaded the script. However, messages are not displayed when the page is refreshed. Also, in the database, it always shows the 'uid_fk' as '1' regardless of who is logged in and posted the messages. Friends tonight I will release wall script installation screen-cast video. As always first class. This is one of my fav blogs. Thanks again! One thing I have noticed, it does fail on HTML validation. I've managed to modify the code and eliminate most of the errors however the code is repeating id's ($msg_id). Have you thought of how to get around this? I can`t seem to locate where you`ve defined that it only should load the current $Session user messages, and not all messages in the "messages" table. Please check my previous post. This is just collaboration of my old posts. Thank you for posting the video and clarifying the installation process. I would like to ammend the script to show all messages. How can this be done? Srinivas, facebook and twitter updates feed time auto. Can you make a tutorial on this. I am following your blog for a long time. You are doing a great work. 1. I attach the whole thing with my register , login , logout , member page . 2. It is working fine . 4. problem here is the member is not able to view or comment to the other members post ; will you help me solve this problem ? first of all thanks for sharing this awesome script. It works great but i would like to ask you some things. 1) i want to make it work with TaskFreak users. i made it and i change the queries. Do you know why is that happening ? 4) and finally , is there any pagination for the comments ? Srinivas are you for hire? i'd like to pay you to implement some of these scripts. 2) and finally , is there any pagination for the comments ? how to : PHP Login Page Example. i tried to use the more result script you make but i can't get it to work. I see with Firebug that i get response from ajax_more.php with the right results , but nothing appears to the main page . i add the script to the main index. Any ideas ? Any guide on how to merge these two scripts ?? I have successfully installed this script, but the wall only shows posts of the logged in user. How can i change this to show all posts? For the script to be a real facebook; from function.php on line 12 remove the words in double quotes below. Thankyou, this is really helpful. I have learn a lot form your script. 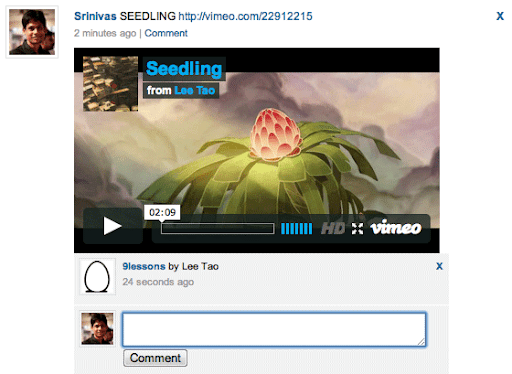 What if I want to embed an image instead a video? I`ve implemented the script, and I`m experiencing a bug. When another user are adding a message, the youtube embed code disappear and the URL is only showing. Have someone located this bug in the code? I did. Because of this I'm trying to add "Facebook like url extractor" instead. Could you please do a tutorial on how to implement a friends system to go with this script? How can i make this id unique so that when i click on a "comment" link it opens commen_text_area for that update. Because now its opening for only one no matter the one you click. How do i make this "id" Unique for each update. Srinivas Tamada I love this script, i have modified to my needs except one issue... i need it to let people make longer posts i have altered the database, but i can't find where in the script that it shortens user input. Great work u did. I modified it my way, but it's not parsing anymore. Ok there's bug with oembed. Download button available header right top. Now the problem is i have a table called friends list with fields, id, user_id, rel_id(relation id). Now i want to integrate friends message to my wall.. How to do that? Nice work you have a great mind.........nice work. How to creat pagination for the comments? can I split this script between 'form input' with 'load_message.php' in the different file? how would i add an image upload to your script? Your script is very good thank you ... but I want to make is that registered users to leave comments on any page you place the application for comment. gracias por el post es muy bueno!! ahora mi pregunta disculpa mi ingles no es muy bueno. 1. How I do for anyone to see the comments left byusers. Something is wrong with oembed? If another post doesnt contain link to video all others post with oembed wont show. Just a link. The download link is bringing me back to the demo. Is there any download link ? how to create a page with all users? My error the character coding. How can I add the code for the http://www.9lessons.info/2009/12/display-collapsed-comments-like.html to the facebook script. A updated version with that would be nice. Great script and job done! How can you remake this script so that only users of a certain group can display/add post to th group facebook wall? So FB authentication and connection is needed. Thanks for this great tutorials.I looking for that tutorials for my site.Thanks again. thanks but where i get wall.js? is there any way to limit the comment count? please help me! i need to made an include in the function file, but i can't when i do it over class it can't find it, and if i do it under public function it still dont work, where can i put a include php in the function file so it works? Very nice! is it possible to add "view all" comments if there are more than 10 comments??? This script is really super. Tried somebody to put it in a active site, not blog, which have already members? I tried but i have problems with connection to data base . You can advice me Srinivas.Indeesd you are very smart . Sorry for my bad english . You can help me pls ? I put on my site it,s work the script very well and it,s very nice but i have problem with the data base .It,s normal i must make other tables for conections . Ty in advance Dr Srinivas . hi srinivash here is some problem in script, because when we post a new text comment over the youtube or any video link, then video link didnt work. hi Srinivas I have problem character " áéűúó "
hey its working fine but how to post comment as a diff. user ??? I download the code from the tutorial , it works fine in chrome, but problematic in firefiox6. The comment text of the messages is below the writer's picture. But when i view your online demo, everything works well. Is there any difference between your demo code and the download code? Will support greek characters ? Show more button on bottom of comments ? Youtube api updated. We have to update our jquery.oembed.js plugin. also is version 4 coming out soon? thanks for this great script btw, i have learn't loads on your site! Facebook Wall Script 4.0 commercial version. When is 4.0 lesson coming? It's ready demo video pending. if i use facebook accound,how can I? If I had a comment with "+1", the wall displays "1". The + disappears. Could someone help me to keep the + in my text ? Today is 5th of october. I am eagerly waiting for that. what is the syntac highlighter that u are using? Hi I really liked this tutorial, I'm testing it because it seems very interesting, if all goes well I'd buy the 4.0 version. I've implemented without any problems, I have only one question, not how to make a user accesses the 'wall' of another user and leave your message or comment here. Deleting a post with images doesnt delete the images. How to? @shrivina I have integrated your script into mysite I think there is a bug with snapshot. When you access wall sometime you have to refresh the page several times before the webcam snapshots work. Do you know why this is happening? this even happens when script is standalone install. Hi srinivas?great work! How do i allow users to see other users comments and comment on them? I have a problem, I use your script for the Russian theme and I need utf-8, but with a change in the tables does not change, and the output is not that necessary. If you change the message by hand to the table in Russian, it appears, as if to add to the wall for example, "Привет"("hello") prints "Ð ¿Ñ? Ð ¸ Ð ² ÐμÑ?" How to fix? Could you please help us define the owner value for when users posts on friend's wall. I only found a reference in your post and didn't find a defined value. I suscribed to mail list of 9lessons.info and I can´t download the file, why? how to do pagination in my posts? Thanks for another great PHP tutorial. Your code is real clean. I had a question, when you reload the wall, why does it reload empty? I have set the user id to a session variable and it is storing in the database properly. Is there a way to make the wall display all posts every time? great Script!!! Can you please update the subscribers email? Can't wait to get the whole Script :D.
I signed up for your infomercials a day ago but i still cant download the wall script. can you plz help me with that?....love ur work btw!! Hey, can someone please tell me why i cant download scripts even though i registered a day back? :( help. hey Srinivas Tamada! russian and romanian don`t work in your script, why? i change the db charset, but the russian and romanian don`t work, how to fix it? i need .zip to version 3.0.! its free ?